Iran Framework Reactions: Promising Deal or Prelude to ‘Horrific War’? Here’s a look at the various opinions on whether Iran and the P5+1 just saved the world or hastened its destruction. The understanding that the major world powers have reached with Iran is an important step toward a comprehensive agreement that would prevent Iran from getting a nuclear weapon and strengthen the security of the United States, Israel, and the region … Getting the rest of the way to a final deal by June won’t be easy, but it is absolutely crucial. The devil is always in the details in this kind of negotiation … The onus is on Iran and must be set high. It can never be permitted to acquire a nuclear weapon. It is a sad chapter of American history when President Obama and Secretaries Kerry and Clinton are more concerned with their legacy than they are with our national security. Unfortunately, this behavior is no longer unexpected; it continues six years of alienating our allies, weakening our international stature, and negotiating with states who have demonstrated that they cannot be trusted. Like the other leaders in the Middle East, Khamenei does not take President Obama seriously. This administration has already erased too many red lines, led too many fights from the rear, let down too many friends and left too many messes. Seen from Teheran, Obama and Kerry appear to be weak and exhausted men, short-term pushovers concerned with their legacy. They will, he believes, sign just about anything that allows them to say that Iran did not get nukes on their watch—a period of time that expires in less than two years. The deal, if signed and carried out, would vindicate the political risks taken by President Hassan Rouhani of Iran and President Obama to engage after decades of estrangement starting from the 1979 Islamic Revolution. Talking to adversaries — as President Ronald Reagan did in nuclear weapons negotiations with the Soviets and President Richard Nixon did in his opening to China — is something American leaders have long pursued as a matter of practical necessity and prudence. Yet in today’s poisonous political climate, Mr. Obama’s critics have gone to extraordinary lengths to undercut him and any deal. Their belligerent behavior is completely out of step with the American public, which overwhelmingly favors a negotiated solution with Iran, unquestionably the best approach. 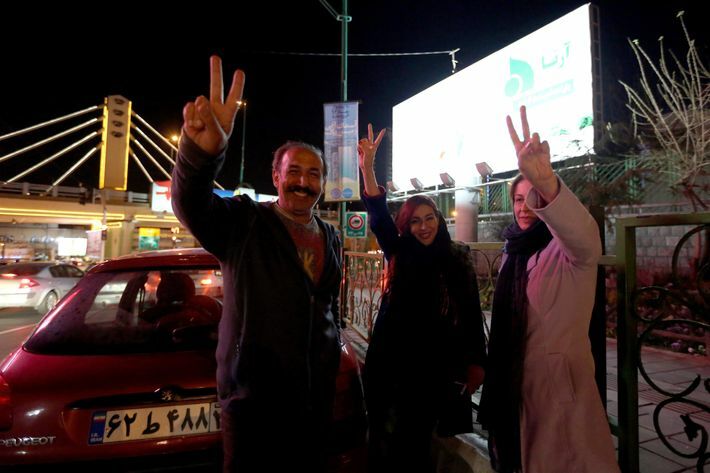 Iranians celebrate on Valiasr Street in northern Tehran on April 2, 2015. The proposed accord will provide Iran a huge economic boost that will allow it to wage more aggressively the wars it is already fighting or sponsoring across the region. Whether that concession is worthwhile will depend in part on details that have yet to be agreed upon, or at least publicly explained. For example, the guidance released by the White House is vague in saying that U.S. and European Union sanctions “will be suspended after” international inspectors have “verified that Iran has taken all of its key nuclear related steps.” Exactly what steps would Iran have to complete, and what would the verification consist of? The agreement is based on a theoretical benchmark: that Iran would need at least a year to produce fissile material sufficient for a weapon, compared with two months or less now. It remains to be seen whether the limits on enrichment and Iran’s stockpile will be judged by independent experts as sufficient to meet that standard. … We hope Mr. Obama will make as much effort to engage in good faith with skeptical allies and domestic critics as he has with the Iranian regime. To be clear, there is no aspect of this agreement that is based on promises or trust; every element is subject to proof. Only if Iran lives up to its obligations, as verified by the IAEA and by our own eyes and ears, will it receive the relief from sanctions that it needs to end its economic isolation. Throughout the negotiating process, we have consulted frequently with our allies and partners, including Israel and the Gulf states, and have vigorously reaffirmed our enduring commitment to their security. We remain deeply concerned about Iran’s destabilizing actions in the region. But it is precisely because we are so concerned about these issues — and about the region’s security — that we believe this deal is critical. I know that some will suggest that the agreed parameters are not sufficient, but the burden will be on them to prescribe a specific and plausible alternative to a better outcome. The fact is that we have reached an important milestone in our years-long effort to ensure that Iran’s nuclear program is and remains wholly peaceful. I hope we will concentrate now on the remaining steps to get this vital job done. 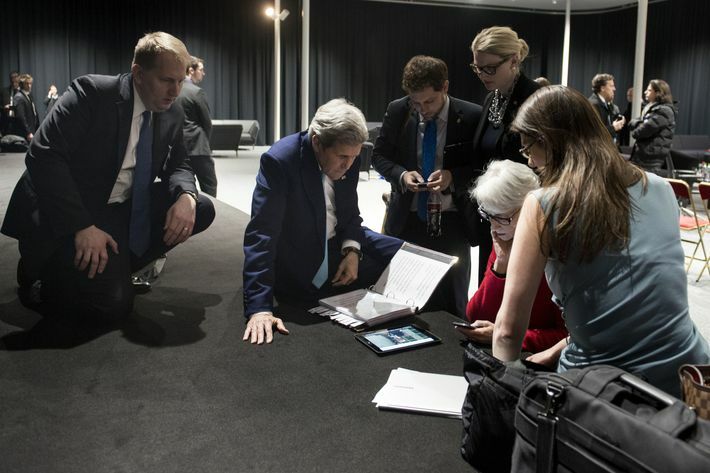 John Kerry watches Obama’s address on a tablet at the Swiss Federal Institute of Technology in Lausanne on April 2, 2015. None of this will be easy. But the prospect of a comprehensive nuclear agreement with Iran in the next few months, if executed rigorously and embedded in wider strategies for regional order and global nuclear order, can be a significant turning point. It can also be a much-needed demonstration of the enduring value of diplomacy. The history of the Iranian nuclear issue is littered with missed opportunities. It is a history in which fixation on the perfect crowded out the good, and in whose rearview mirror we can see deals that look a lot better now than they seemed then. With all its inevitable imperfections, we can’t afford to miss this one. Critics will be eager to find fault regardless of the progress that’s been made. But demanding a deal tantamount to surrender by Iran, such as having it totally dismantle its nuclear program, even for peaceful ends, was never in the cards. No deal is perfect, and neither is this one, but it should be judged on the merits and on the content — and keeping the bleak alternatives in mind. Finally, once it had been attacked, Tehran would invoke the need for a deterrent against future attacks and would work directly and speedily not on a nuclear program but a nuclear weapon. In his op-ed advocating war with Iran, former U.N. ambassador John Bolton argues that military attacks “should be combined with vigorous American support for Iran’s opposition, aimed at regime change in Tehran.” But bombing and then threatening the Islamic Republic’s existence would likely produce exactly the opposite effect — a government strengthened at home with a clear rationale to acquire a nuclear deterrent. 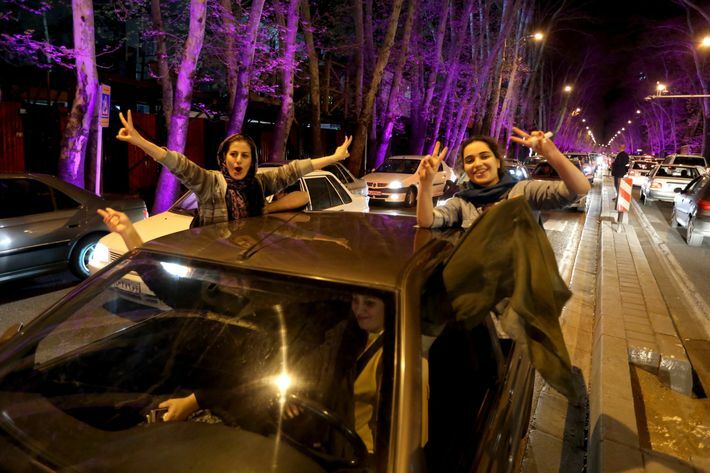 Women celebrate on Valiasr Street in northern Tehran on April 2, 2015. And on that score it was dispiriting to hear Mr. Obama resort to his usual false dilemma gambit that Americans have only two choices—his agreement or war. He claimed to “welcome a robust debate” while all but declaring a difference of opinion to be illegitimate. … The truth, contrary to the President, is that the critics of his Iran framework do not want war. But they also don’t want a phony peace to lead to a nuclear Middle East that leads to a far more horrific war a decade from now. That’s why this agreement needs a thorough vetting and genuine debate. So the basic tradeoff achieved by Secretary of State John Kerry in the talks with Iran boils down to this: Iran has to watch its step for 10 years. Then all bets are off. A year later, bombs away! Once the final agreement is in place, the mullahs can proceed to do what they will say they are not doing, until their bomb is real and they can use it at will. Islamic good faith is good enough for Mr. Obama, who has a soft spot in his heart for Islam. Islamic good faith is not good enough for the rest of us. The president is entitled to indulge that soft spot in his heart, but he is not entitled to indulge a soft spot in his head at the expense of the nation. He doesn’t have to be the secret Muslim some of his critics say he is to be a faithful guardian of the interests of the Islamic world. Mr. Obama should have walked when Tuesday’s deadline failed to hold. Absent an ultimate deal, something good can always happen down the road. With a bad final deal nothing good will happen, and bad things will surely follow. In the end he should toughen the sanctions and wait out the mullahs. No one in America would be angry. Most would think “Wow, if he walked, it must have been a terrible deal—give him credit for trying!” Everyone else would be relieved. That would enhance his foreign-policy legacy. That would be a win. Sure, a large portion of the American public has been known to attack Obama for things like wearing an ugly tan suit and the way he pronounces Pakistan, but they’d definitely be understanding if he abandoned a historic nuclear deal. 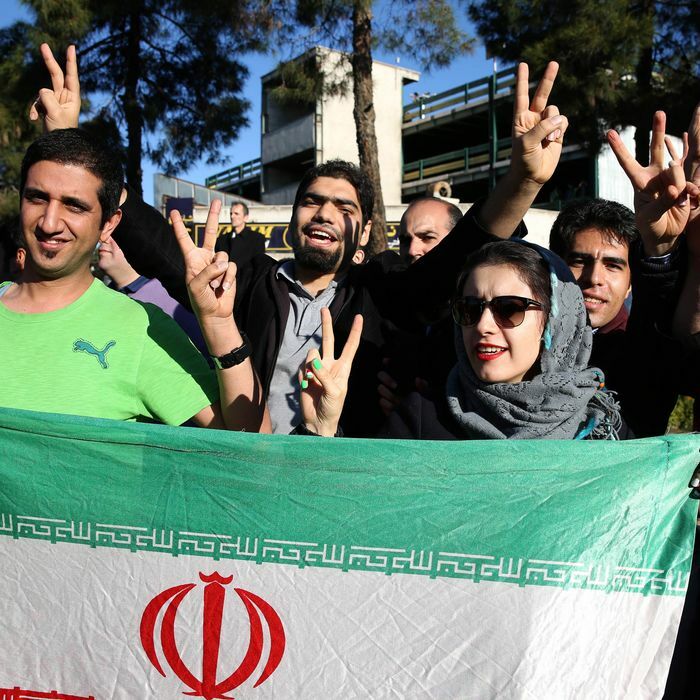 Iran Deal: Promising Deal or Prelude to War?